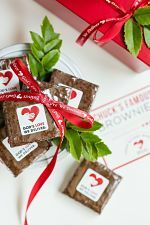 Donate Monthly and We'll Send Brownies to Your Sweetheart for Valentine's Day! Your monthly gift will help provide nutritious meals and unlimited nutrition counseling all year round for individuals and their families affected by life-altering illness. If you would like God’s Love to send a 4-pack of brownies to someone special, please select ‘Yes, this is an honor or memorial gift’ and notify 'By Mail' below and enter their name and address in the accompanying form. *Please note: Only orders received before 12pm on Monday, February 11 will arrive on Valentine's Day, Thursday, February 14. Orders received after 12pm on February 11 will arrive later that week. **Offer only available to first-time monthly donors. Please include honoree first and last name. Yes, please include the gift amount in the postal notification message. Yes, send me a copy of this email notification. Yes, I'd like to receive email updates from God's Love.